Being the one in-charge of the cake production at work, I have the liberty to decide on what to sell. We serve Strawberry Cake on Sundays. The price of strawberries had gone up towards the beginning of summer so I had to make some changes in the menu. In tropical countries, summer means mango season so I took advantage of the abundance of this fruit. 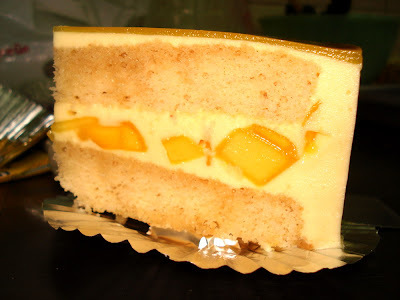 We Asians love mangoes and I am pretty sure the new cake will be a big hit among our customers. I was right! 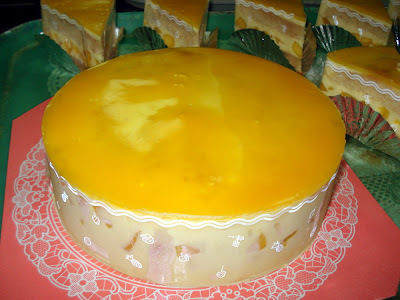 This mango mousse cake was based on the recipe of happyhomebaking. I made some modification and it turned out good. 1. Grease an 18 cm round pan. Line the base with parchment paper.Preheat oven to 160 deg C.
2.In an electric mixer, beat the eggs and sugar together until light and fluffy. This will take 5-7 minutes. Meanwhile, melt the butter. Let it cool to room temperature. 3. Sift the flour over the egg mixture. Fold it gently with a spatula until well blended. 4. Fold in the melted butter. 5. Add the milk and lastly, add the vanilla extract. Fold it gently until well incorporated. 6. Pour the batter into the pan and bake for 25-30 minutes or until a skewer inserted in the center comes out clean. 7. Unmold and cool completely before frosting. 1. To make the mango puree: Place 300g mangoes in a blender. Add 30 - 40 g of brown sugar. Puree. This mixture will yield about 350 g of puree. Just take the amount called for in the recipe. Don't throw the excess, you will need it later for the decoration. 2. In a medium bowl, soak the gelatin leaf in water until soft. Squeeze out any excess water. 3. Add 50 g water to the softened gelatin and place over a pot of simmering water until the gelatin melts. Keep the gelatin mixture warm. 5. Add the gelatin mixture to the mango puree. Mix well. 6. Lastly, fold in the whipped cream into the gelatin/mango mixture until well blended. You need an 18 cm bottomless ring and a base of a spring form pan. 1. Cut the cake base into two layers. Use the base of a spring form pan, just a bit smaller than the base of an 18 cm bottomless ring, to guide you as you cut the cake. 2. Place one layer of the cake at the bottom of the ring. Ladle the mousse over the cake and with the ladle's base, spread the mousse evenly. 3. Lay the diced mangoes . Mask them with the mousse. 4. Place the other cake layer on top. Cover it with mousse and smoothen the surface with spatula. 5. Chill until the mousse has set. 1. Add 1 TBSP of water to 5 g of softened gelatin leaf. Melt the gelatin in a pot of simmering water. 2. Add the mixture into the mango puree. Mix well. 3. Pour over the cake and smoothen it with spatula. Chill the cake until the top has set.